Created in 2004 by Catherine Kablé, a former banker, Kablé Communication is a media relations and communications consultancy agency. Our team comprises highly skilled and experienced professionals, specialised in finance, private equity, start-ups, fintech, innovation and digital media. Our experience was gained both in France and internationally, from consultancies, investment banks, the UK regulators and journalism. Our strong reputation is built on our proactive approach, our ethics and our results-oriented culture. 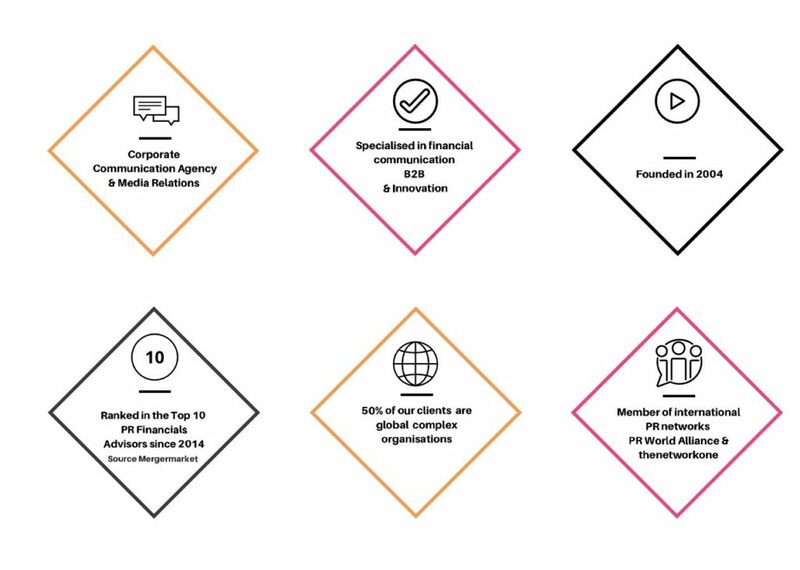 We provide our expertise to a wide range of firms, from start-ups to complex international organisations, across all industry sectors. We always challenge ourselves to offer the best services and give the right advice on current issues, while adapting our communication and PR strategy to meet your needs. Specifically the agency provides strategic communication, media relations, PR and influence relations, crisis and issues management, media training, content, digital communication and financial PR. The world has been weakened by the crisis, leaving communications agencies with no choice but to set new goals for themselves. Pursuit of profit can no longer be the only driving force for businesses and the economy. We have thus concluded a moral pact with our clients to highlight not only their competitiveness, strengths and talents but also their values, ethics and corporate citizenship. These new practices in our profession must help re-establish widespread trust in the financial world and in our country’s economic fabric. At the core of this new approach lies the vital role businesses play in innovation and job creation. We have also committed to live our values through our recent engagement with the Global Compact France.